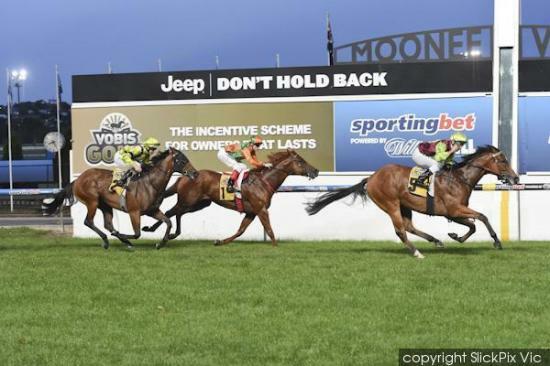 Trainer Wendy Kelly is likely to resist the temptation in the short-term of chasing bigger prizes with impressive first-up Moonee Valley winner Fast Cash. Instead Kelly is likely to go chasing more of the VOBIS Gold prizemoney on offer after Fast Cash's success in the $150,000 VOBIS Gold Carat over 1200m on Saturday. Fast Cash was a $10,000 purchase at the VOBIS Gold sale and with his second win from five starts he's now closing in on $160,000 in prizemoney. Ridden by Vlad Duric, Fast Cash ($3.30) scored a lengthening 1-3/4 length victory over Tudor ($5) with Rough Justice ($5) a half-length away away third. After his last preparation which included a second placing to classy three-year-old Rich Enuff, Kelly and connections sat down and decided to set Fast Cash for the Gold Carat. "We went through the calendar, found this race and targeted it today," Kelly said. A lot of work has gone into turning Fast Cash's racing habits around, turning him from a get-back, run on horse to one that can bounce and take a position. "Because he's racing differently this time in we'll reassess him but if he can be a little handier this time he may stay a little further," Kelly said." She said the gelding may be nominated for the Australian Guineas at Flemington on March 7. Duric said Fast Cash will derive benefit from the run as he was going into the race off a very soft trial. "He's pulled up really big but he'll take a big step forward from that race," Duric said. "Hopefully she takes her time with him."